Harvey Pekar: Chronicler Of America's Everyman The comic world lost one of its titans when Harvey Pekar died last July -- but he won't soon be forgotten. Pekar's friend Jimi Izrael is developing a college course to help ensure the writer's legacy and show how his life and work are the embodiment of the American dream. The comic world lost one of its titans when writer Harvey Pekar died last July. The Cleveland native and son of Polish immigrants chronicled his life -- and the everyman -- in his autobiographical works. 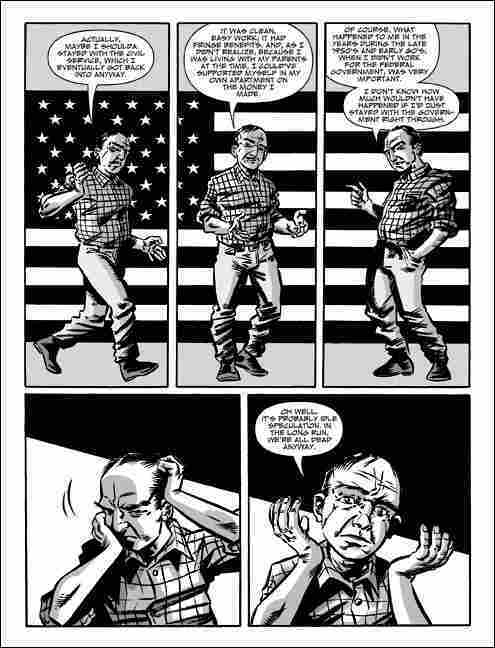 Harvey Pekar's fictional self contemplates regret in The Quitter. Jimi Izrael, a blogger and contributor to NPR's Tell Me More, was a friend of Pekar's and is developing a course at Case Western Reserve University to help ensure Pekar's legacy among a new generation of writers and comic fans. He tells NPR's Neal Conan that he looked up to Pekar as a mentor and sees his life and work as the embodiment of the American dream. Izrael says that while it's easy to dismiss Pekar as "Cleveland's curmudgeon," there is a universality to his less-than-rosy point of view. "Nobody's crazy about being broke," he says. "That was one of the things that people should take away, that he was just a working guy trying to figure out how to navigate the American dream, like a lot of us are." Izrael fondly remembers Pekar as a "hustler, in the very traditional sense of what America's about. He wasn't taking the dream for granted." What's more, Izrael says Pekar was a tremendous listener and often reflected on what he heard in the panels of his books. "He didn't listen to people like you and I listen to people, where we're trying to categorize them or figure them out. He listened to them genuinely," Izrael says. "He wrote about what they said and what they did in a very genuine, non-judgmental way." Pervasive though Pekar's reputation is, Izrael insists that he wasn't just a hopeless, grumpy curmudgeon -- and that's one of the things that prompted him to develop an entire course devoted to his friend. "The Harvey I knew was a friend and he was a giving writer and colleague," Izrael says. "And I miss him."